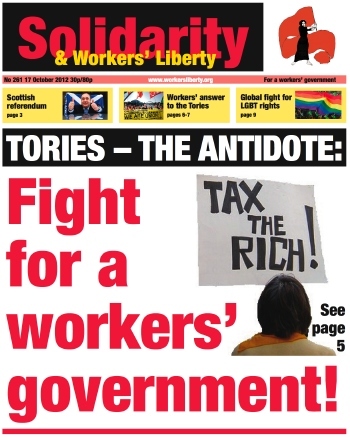 Tories - the antidote: fight for a workers' government! A sectarian sidetrack in Syria? Strikes against American retail giant Walmart, which began in warehouses operated by Walmart’s suppliers in southern California and Illinois, have now spread to 28 stores in twelve states across the USA. The Illinois warehouse workers have already returned to work, having secured their key demands of reinstatement of all who were fired or suspended for on-the-job organising, as well as full back pay for all workers who took part in the three-week strike. Members of teaching unions NUT and UCU at K College in Kent struck for half a day on Monday 8 October as part of a battle to save 145 jobs. The workplace is spread over six campuses and has more than 25,000 students. College bosses want to make cuts to shrink an £11 million deficit. 57 jobs have already been lost, and workers fear that campuses in Ashford and Dover could be sold off altogether. Staff walked off the job at 1pm and held pickets and protests at college sites. Ballots on this year’s Higher Education pay claim have produced mixed results amid disillusion over the handling of the pensions dispute. Following three years of increases well below inflation, employers were offering a pay rise of just 1% — a real-terms pay cut of 12% over four years. The unions asked for 7%, guarantees that no staff would get less than the Living Wage (£8.20 per hour in London; £7.30 elsewhere), and action on the gender pay gap (still 15%) and casualisation. As reported in Solidarity 260 (10 October 2012), teachers at Bishop Challoner school in East London voted to strike in opposition to a threat from the headteacher to impose a “mock” Ofsted inspection. Bishop Challoner teachers had previously voted not to cooperate with or participate in any such inspection or observation, as part of the ongoing industrial action by the NUT and NASUWT teaching unions. Since the May and June elections in Greece issues that previously were discussed only in the small meetings of the revolutionary left have become part of the everyday discussion of ordinary people, new to the struggle and new to revolutionary jargon. What should be the tactical and strategic aims of a left government? Should the left wing tendencies form a united front on a trade union level, or a political level, or both? What type of party organisation is required? Democratic centralism, pluralism, federalism? This book tells the story of the incremental implosion of Rangers Football Club and raises issues of greed, abuse of power, press complicity but also what campaigning using digital media can achieve. For a shorter summary article, see also: "Tories - the antidote: fight for a workers' government!" Our bosses, and the governments which serve them, are determined not to waste the economic crisis. They want to use it as cover for driving down social costs, freezing wages, cutting jobs, so that when the economy revives profits will be higher. Our new book, Antonio Gramsci: Working-Class Revolutionary, is now available to buy from radical bookstores, online and from local AWL branches. A public launch meeting for the book, featuring presentations from its editor Martin Thomas, and contributor Peter Thomas (author of The Gramscian Moment), will take place in London on Wednesday 31 October. In publishing the book, we aim to re-assert the class-struggle soul of Gramsci’s politics, an immense contribution to revolutionary strategy and thought.